With this freeware program, you are able to activate some interesting solid state drive tweaks. 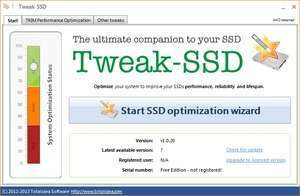 Tweak-SSD is an application which can apparently help you improve the speed of your hard drive by implementing things like Superfetch which is able to keep frequently used files in cache. This alone can help improve the life of your SSD drive as well as the speed at which it performs. Another thing that isn't necessary with a solid state drive is Windows Indexing Service which this program will guide you to disable. Version 2.0.50 is a freeware program which does not have restrictions and it's free so it doesn't cost anything. For security reasons, you should also check out the Tweak-SSD download at LO4D.com which includes virus and malware tests. Additional screenshots of this application download may be available, too. Tweak SSD download been highly rated by our users.